The NY-NJ Harbor Estuary, home to the Port of New York and New Jersey, is one of the most urban estuaries in the world. It is formed by a complicated network of waterways entering into the estuary, including the Passaic, Hudson, and Raritan Rivers. The estuary and surrounding areas have long been known as a hub of cultural and ecological diversity. Historically, oyster reefs were prolific and an important part of the ecosystem, providing filters and habitats for other aquatic organisms. With the advent of the Industrial Revolution, overfishing, and pollution, the oyster reefs in the estuary were decimated in the early 20th century. Thanks to better regulation of pollution, water quality has improved to such an extent that investments in oyster bed restoration projects within the Harbor Estuary were started in 2010. Recent observations at these reefs show that adult oysters are producing natural growth of baby oysters, providing hope they may support the first naturally sustaining colonies in nearly 100 years. Still, the Bay faces threats, fueled by the widespread production and use of plastics. Though plastics break down to small particles quickly, those small particles are nearly indestructible. EPA Trash-Free Waters (2017) supports research to understand the toxicological effects of microplastics. 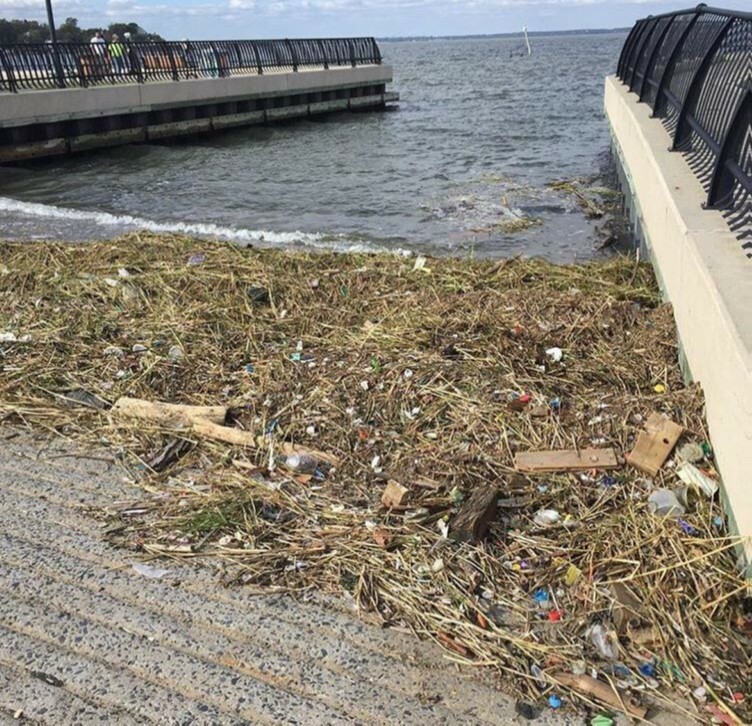 The NY/NJ Baykeeper is the first organization to document the abundance and distribution of plastics pollution in the NY-NJ Harbor Estuary, raising awareness about this problem and advocating for solutions. The map on the left (modified from National Geographic, 2016) shows the extent of the NY-NJ Harbor Estuary Watershed. 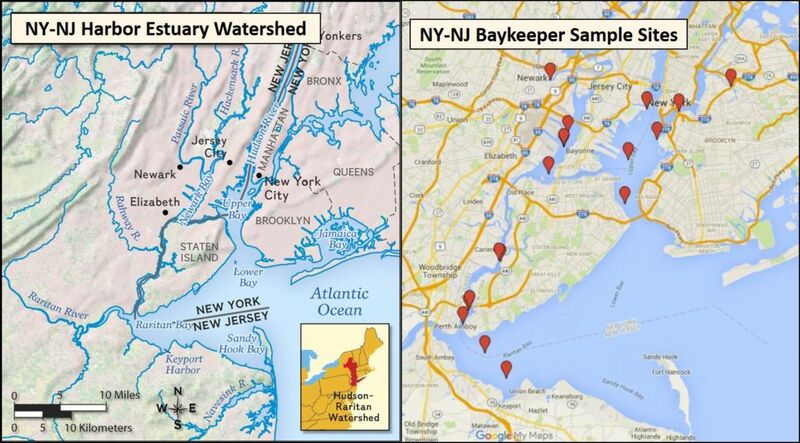 The image on the right (from NY/NJ Baykeeper) marks sampling locations within the estuary. 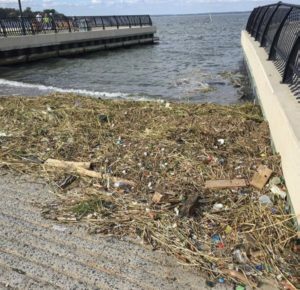 The NY/NJ Baykeeper, funded in part by the EPA Urban Waters Small Grants Program and in cooperation with Rutgers University, has undertaken an analysis of plastics present in the waters within the NY-NJ Harbor Estuary Watershed. The Baykeeper (with the help of Ironbound Community Corporation) recruited high school student volunteers and engaged Rutgers University student interns to collect samples in locations along the Raritan and Passaic Rivers and within the Harbor Estuary. The samples were collected using a manta trawl, a manta-ray-looking device with a trawling net size recommended for international ocean studies. Using common techniques for quantifying synthetic particles in water, the samples were analyzed and separated by size and types. Results of the analysis show that 5 different types of plastics are found within the NY-NJ Harbor Estuary watershed: fragments, foam, line, pellets, and film. Poly-styrene foam was the most abundant type of plastic. Of the total 6,932 particles of plastic counted, 85% were microplastics (<5 mm), and 38% of those were < 1 mm in size. From this study, NY/NJ Baykeeper (2016) estimates that more than 165 million particles of plastics are floating in the estuary at any given time. Rutgers University student interns and students from East Side High School use the manta trawl to collect samples. Advocating for change starts first with quantifying and documenting the extent of plastics pollution. The NY/NJ Baykeeper study illuminates the high prevalence of plastics pollution within the Harbor Estuary and highlights the importance of both decreasing plastics consumption and increasing disposal awareness. Plastics like fishing line and soda can rings have a negative physical effect on animals living within the estuary habitat. Birds and fish are entrapped and entangled within these plastics, causing injury or death. While microplastics are the most abundant in the NY-NJ Harbor Estuary, their immediate effect is less noticeable. Washed-up plastic debris is seen in Keyport, NJ. Microplastics absorb contaminants like polychlorinated biphenyls (PCBs), polycyclic aromatic hydrocarbons (PAHs), pesticides, and flame retardants, all of which are found within the NY-NJ Harbor Estuary in high concentrations and can remain in the water for decades. When contaminated microplastics are mistaken for food resources by the species living within this habitat, they get incorporated into the food webs. In fact, several studies have shown that microplastic contamination is found in the tissues of finfish and shellfish, which then has the potential to move up the food chain and pose harm to human populations. The NY/NJ Baykeeper continues to research the links between microplastics pollution and its effects on wildlife and human health. Although the source of the plastics remains unclear, the “NY/NJ Baykeeper is on a mission to understand the plastic’s journey—whether it’s from shipping, littering, stormwater runoff (which is also usually from littering), or wastewater discharge” (Kakaes, 2017). The organization is also engaging others to get involved to track plastics pollution in the NY-NJ Harbor waterways through the Baykeeper Plastic Story website. Because the NY-NJ Harbor Estuary is one of the most urban estuaries in the world, it is no stretch to link the prevalence of plastics pollution to human behaviors. EPA Trash-Free Waters (2017) states that nearly 80% of trash found in marine waters comes from terrestrial sources, and between one- to two-thirds of the trash on beaches is single-use disposable plastics. The EPA also contends that source reduction is the most effective way to reduce marine debris. In turn, changes in public consumption and disposal habits will dramatically decrease the amount of microplastics making it into the waterways and, subsequently, into the aquatic food chain. EPA Trash-Free Waters. 2017. Toxicological Threats of Plastic, Sources of Aquatic Trash, and Preventing Trash at the Source. Kakaes, Konstantin. 2017. A Hundred Million Invaders: The NY/NJ Baykeeper’s War on Microplastic. National Geograpraphic. 2016. Hudson-Raritan Estuary. NY/NJ HEP. 2017. New York-New Jersey Harbor and Estuary Program. NY/NJ Baykeeper. 2016. NY-NJ Harbor Estuary Plastic Collection Report.